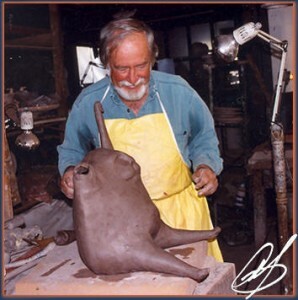 Al Davis has been creating humorous stoneware sculptures for over forty years and his work resides in both public and private collections nationally and internationally. He graduated from Massachusetts College of Art and then held the position of Artist in Residence at MIT. He was an Exhibit Specialist at the Smithsonian Institution and taught at the Corcoran College of Art and Design in Washington, DC. He currently maintains studios in both Wellfleet and Provincetown Massachusetts. Although semi-retired, Al is still creating limited edition and one-of-a-kind pieces as well as his famous cats, dragons and birds that have delighted long-time and beginning collectors for years. He believes strongly in making “household” art that is accessible to anyone. His beautiful designs are often deceptively simple, requiring unique skills and techniques to mold and sculpt clay without the use of internal armature. His timely political commentaries, whimsical animals, fountains, dynamic abstracts and graceful, almost primitive figures are unique in the art world.